Saudi Arabia has been carrying out vengeful aggressive missile strikes against civilians in Yemen for almost three years now, with weapons purchased from the US and UK. Here is a short Slideshow that I created for The Rabbit Hole my Facebook news page (with before and after pictures of Yemen and brief commentary). In addition to the airstrikes and military action it has also blocked food, and resources from reaching civilians. What would happen if Western countries refused to sell weapons to genocidal nations such as House of Saud? Taking into consideration that these weapons are used to commit genocide against one of the poorest nations in the region. If your answer is along the lines of fewer people would be killed, then you may be right. Either these wars of aggression would cease to exist or at the bare minimum, they would be minimized substantially. This is a clear indication that not only are these “first world countries” complicit in these crimes against humanity but that they are actually fueling these wars. The United States thrives on wars, it benefits financially from creating creative chaos in other countries. The United States bases its military and political intervention on false allegations and pretenses. Under the guise of offering “help” through “humanitarian intervention,” it sets the stage for massacres, death, famine, and destruction. Morally bankrupt men and women in suits are responsible for death and disease around the world, it goes against everything we are taught or more accurately indoctrinated to believe through our educational systems in the West. These bankers, politicians, war-hungry psychopaths are simply human shells roaming the earth, completely void from within. “The reopening of Yemen’s main port by Saudi Arabia will not be enough to avert famine in the country unless all restrictions are lifted and commercial goods allowed in, aid agencies say. On Monday, the Saudi-led military coalition announced it would allow aid to re-enter Yemen’s main port and United Nations flights to resume, more than two weeks after they imposed a total blockade on the country. The UN and international aid agencies have repeatedly urged the coalition to lift the Yemen blockade. The innocent lives that are spared from death by missile strikes are left to barely survive while famine and disease demolish any chance for a normal existence. 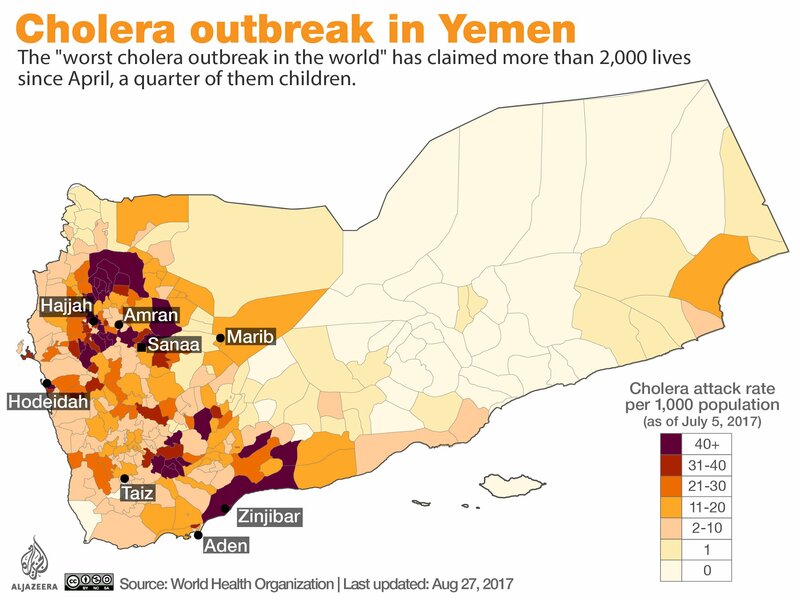 Currently, “Yemen’s cholera epidemic is the worst in recorded history according to Oxfam”. A civil war would indicate that Yemenis are fighting other Yemenis for control. This in itself is wrong. Yemen’s resistance (which includes Ansarullah, the Republican Guard, and others) is currently fighting Saudi-backed mercenaries on the ground. This includes many Sudanese and U.A.E. soldiers as well as privately-hired Blackwater mercenaries. It can’t be a civil war because Saudi Arabia and their allies are an invading force occupying Yemen shipping in foreign fighters. If any news outlet boils the war in Yemen (or any war, really) down to a mere Sunni-Shia conflict, you should immediately stop reading that outlet. This argument, first of all, ignores all other factors and power structures boiling a conflict down to mere religious differences. It’s just plain ignorant. Yes, Yemen’s Ansarullah movement was founded by Zaydi Shia Muslims. But it includes fighters and politicians from several sects and religions who simply don’t want foreign powers controlling their country. Plus, calling Saudi Arabia Sunni while ignoring their intolerant and violent Wahhabi ideology is a disgrace to all peaceful Sunni Muslims. A look back at the last century of Arabian history tells you all you need to know about the Saudi’s intentions in Yemen. During Yemen’s 1962 revolution, Saudi Arabia supported the Royalists fighting to keep Yemen an Imamate. They knew that an independent Yemen would turn into a strong country– just south of their border– which would become a competitor. Even back then, a Shia-led Imamate was preferable to a Yemeni republic from the Saudi’s perspective. Yemen is still the only republic on the Arabian peninsula. Such is still the case today: Saudi Arabia cannot stand to see a pluralist, economically-viable, independent republic on the Arabian Peninsula. The Saudi’s behavior in Yemen is genuinely gruesome and repulsive. How can the United States and their friends in Europe possibly justify militarily supporting this war of terror? Ah yes, Iran, of course. Unfortunately for the imperialists, there isn’t evidence to back this accusation. In fact, all of their “Iranian influence” claims end up leading to dead-ends such as ambiguous boats in the gulf or unidentified smuggling routes via Kuwait. Not only do Ansarullah, Yemen’s resistance, and Iran all deny a relationship, but there isn’t evidence to suggest they have one. Yemen’s Supreme Revolutionary Committee based in the capital Sana’a has the equipment to manufacture and develop their own weapons. The former President Saleh was a previous U.S. ally who received significant military aid during the early “War on Terror” years. So there’s no shortage of weapons in Yemen. And has the media forgotten the Saudi-imposed land, sea, and air blockade? Why is Saudi Arabia bombing civilians in the resistance-held territory while al-Qaeda continues to flourish in other areas? Al-Qaeda is a de-facto ally and pawn of Saudi Arabia and the United States. That is until they get a little too strong and the U.S. steps-in to carry out some messy, high-profile, special operations. In portions of southern Yemen, al-Qaeda members fight alongside Saudi-backed troops. Saudi Arabia and the U.A.E. employ local mercenaries to fight on their behalf. Who’s to say there aren’t al-Qaeda members on this payroll? No one, because this is never discussed.Regardless, al-Qaeda and the Saudi coalition both fight a common enemy: Ansarullah. The Saudi’s main objective in this war is to destroy Yemen’s resistance movement– not fight al-Qaeda. Any attack on al-Qaeda from the United States is done so in a way to exert pressure on Ansarullah forces– not to obliterate the group entirely– just like they use Daesh (ISIS) in Syria and Iraq. The only force capable of fighting al-Qaeda and Daesh in Yemen is Ansarullah along with their allies. They are the only genuine enemy of these terror groups in the country. As a revolutionary movement, they have a significant stake in keeping communities safe from violence and reactionary, intolerant forces like al-Qaeda. Ansarullah and their allies are the only entities in Yemen taking substantial steps to eradicate terrorist groups from their territory. Security forces set up multiple checkpoints and frequently bust would-be terror attacks. This fact, of course, is conveniently ignored by mainstream media. On the other hand, suicide attacks from groups like Daesh or al-Qaeda are relatively frequent in Saudi or U.A.E.-held territory. Official estimates track the Yemen war death toll at about 12,000. Local sources report the number as much, much higher. And still, this number only reflects deaths from air strikes and military operations. Yes, the Saudi’s air strike campaign kills civilians on a near-daily basis. But just since April, over 2,000 people have died from a globally-unprecedented cholera outbreak. And once again, this is only the official number. 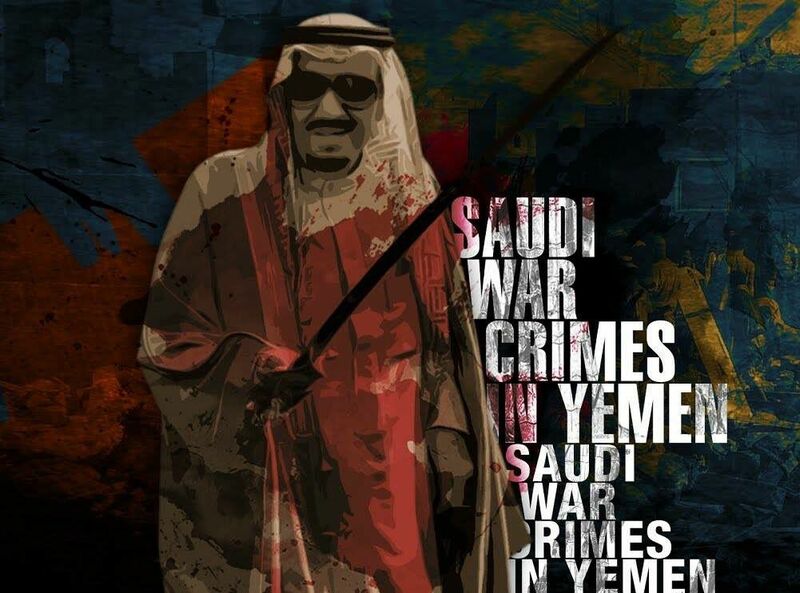 The Saudi-imposed land, air, and sea blockade is directly responsible for triggering this outbreak. This is clearly intentional and strategic. Not only do the Saudis frequently deny aid entry to Yemen, but they do not allow civilians to leave for medical treatment and they’ve destroyed infrastructure at key Yemeni ports. Not to mention, due to the blockade, millions of Yemenis are on the brink of famine at any given point. 9: The UN and International Community Have Literally Done Nothing to Help. Since the world powers ally with Saudi Arabia and their friends in the Gulf Cooperation Council, Yemenis’ cries for help fall on deaf ears. Other than a few scoldings, the United Nations has done absolutely nothing to slow down the war. They have not pressured Saudi Arabia to open the Sana’a airport. They rarely encourage peace talks. And they have not urged the United States or the United Kingdom to stop arming Saudi Arabia. In fact, under pressure from Saudi Arabia, the UN secretary general Ban Ki-moon actually removed them from a list of countries violating children’s human rights. Until the war in Yemen ends, western media will continue to play both sides of the fence. In the iconic words of Donald Trump, they will continue to condemn “violence on all sides.” (Not related, but seems to apply well.) And of course, they will completely ignore that one side has an air force and the backing of the world’s most powerful military while the other side is defending themselves from invaders and terrorists. Western media will continue to condemn the wrong groups while whitewashing the terrorist behavior of Saudi Arabia’s and their allies. Hear how little displaced Yemeni children described the war, and what they miss most about Yemen in the video below. 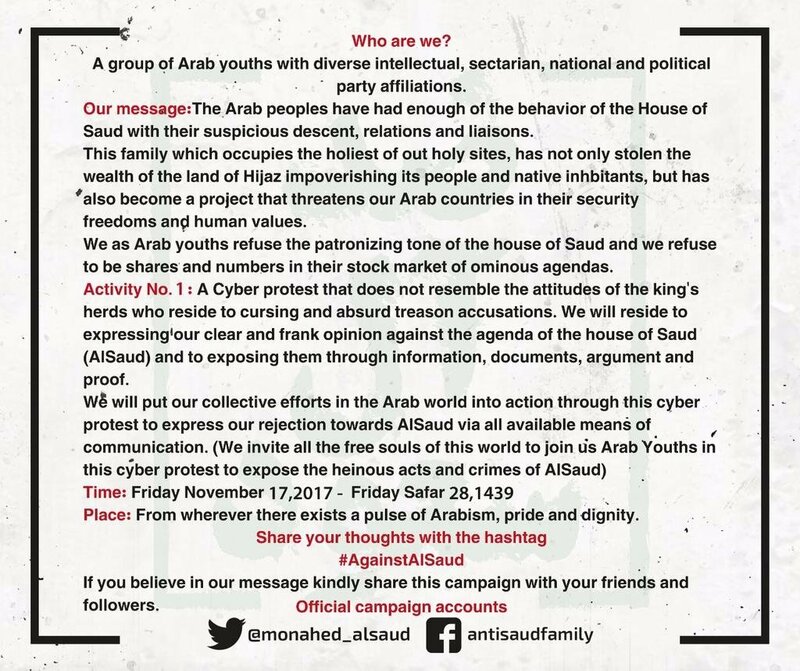 If you’ve been on twitter lately you might have noticed the influx of tweets with the hashtags: Yemenblockade, Yemengenocide, Yemenstarvation, YemenCrisis, and a new one that came out recently and was started by Marwa Osman hashtag AgainstAlSaud. 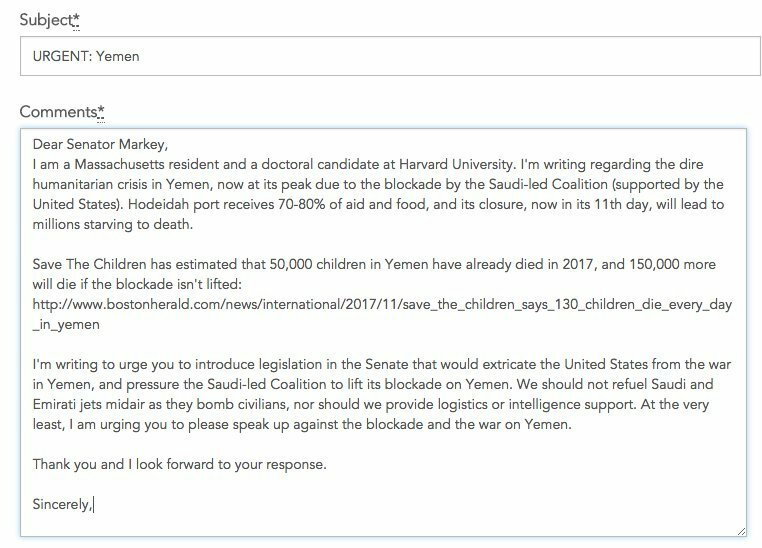 Friends, please please please email your Senators about Yemen now. 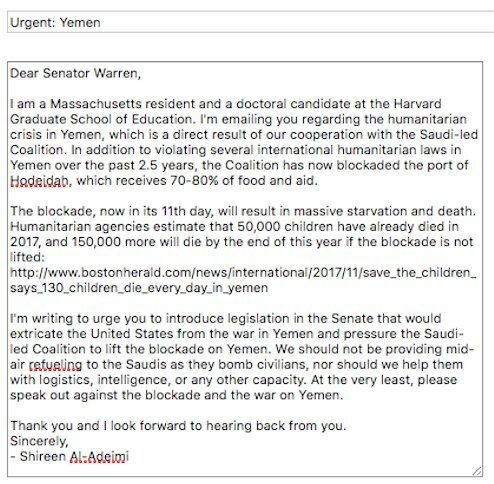 I’m attaching the emails I’ve sent to @SenWarren and @SenMarkey below. Before you send yours, take a screen shot and respond here. Let’s do this for Yemen!